You are here: Home / News & Announcements / We are Proud of You! My name is Sharon, and I am the face behind the SMSCRAPPER videos on Youtube, as well as The Night Owl Scrapper Blog. I love everything crafty, and I’m very into scrapbooking, card making, and altered projects. I have been creative, and into the arts all my life, being introduced to many different aspects of it since very young. I am the busy mom of a toddler, who loves creating, and sharing with people from all over the world. I’ve been actively scrapbooking since the end of 2008, and have been making video tutorials, and more on YouTube since April of 2010. I currently teach at my local scrapbooking store, and have been lucky to work with several companies in the field. This hobby is my way to relax, and I could not live without it! Today I’m very excited to share my Guest Design Post for The Paper Nest Dolls. 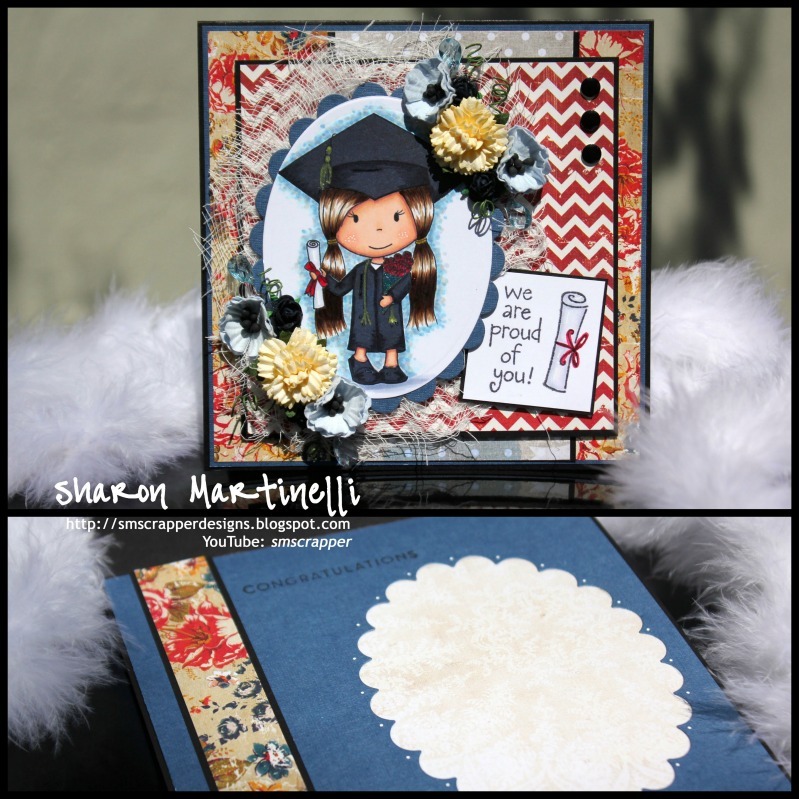 I used Graduation Ellie for my card, and I loved using her, as well as the Glitz “Yours Truly” Design Paper. Ellie is super adorable, and so easy to paper piece, which is what I did with her outfit. I colored her skin, hair, and accesories with my beloved Copic Markers. I added some cheese cloth for some texture in the back of the image, and added some paper flowers and some bling from my stash. Below you can see a picture of the inside of the card. I enjoyed working with Ellie, and I hopeyou liked my project. Thanks so much to The paper Nest Dolls for inviting me to Guest Design. I had a blast! Take care everyone!